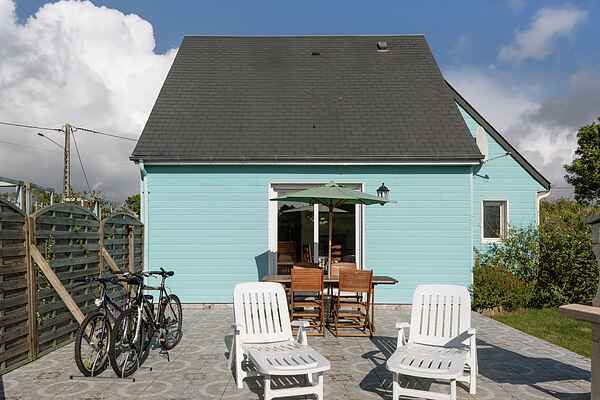 This cheerful blue-and-yellow holiday home is the perfect place for a nice beach holiday! It's surrounded by an enormous, fenced-off garden. Plenty of privacy! The front terrace with picnic table is a great place to have breakfast in the mornings. In the afternoons you'll have plenty of sun on the terrace, which is also accessible via a French door in the bright living room. The house is neatly decorated. With the available barbecue you can quickly and easily organise a culinary evening, Fun to round off a day at the beach! You are only 2 km away from the sandy beach in Saint-Germain-plage. You'll find the dunes only 200 metres from your home! Lovely for a nice stroll at any time of day. You can also take healthy walks directly from the house in the \"Parc Naturel des Marais du Cotentin et du Bessin\" regional nature reserve. Further inland, is the beautiful city of Coutances (27 km) with its impressive cathedral and cosy streets. You also can't miss Normandy's most important public attractions; the famous Utah Beach invasion beach (50 km) and the corresponding museums, like that of Ste. Mére-Eglise (50 km). The owner offers bicycles and wants to know in advance how many bikes you wish to use and for what ages.